During the fourth Wine & Friends event, renowned chef and three Michelin stars winner brought a glimpse of gastronomic magic and Italian charm to Martinis Marchi. The love of cooking was an inevitable path that his family tradition and parents led him to. Their perseverance made all the splendour that we see today come to life and Roberto, Bobo for his friends, proudly told us their story. 52 years of family tradition, a lot of passion, but also sacrifice, have enabled us to get three Michelin stars that we are very proud of. The restaurant in the centre of Bergamo was opened in 1966 by our parents, true food aficionados, especially when it comes to sea food, which was just starting to emerge at the time. My father received his first Michelin star in 1978, and the restaurant became an inevitable stop for seafood lovers. He received the second star in 1996, and when he died in 2005, we moved the restaurant to Brusaporto, only 10 kilometres from Bergamo, where we run the Relais & Chateaux hotel with only ten rooms. My siblings and I, two sisters and two brothers, now run the business with the help of our wives and husbands. We got our last star in 2010 and we are very pleased with everything we have achieved, which does not mean that we have time to rest. There are 140 employees in the complex, including 40 in the kitchen, so we are a small ‘factory’. We discuss problems, ideas or new projects at our family meeting once a week, all this with the ‘supervision’ of our mother who is the director and president of everything. Did your family influence your decision to become a chef? Even as a little boy, when I would come back from school, my parents asked me to help them in the kitchen, but I did not think about cooking as a possible career at the time. As time passed I realized that this is the job I love and wanted to continue doing it. I never thought about the ultimate outcome, but cooking has become my life. You started working in the kitchen when you were eleven; do you remember the first dish you ever cooked? I was 11 so I was not able to cook a proper dish, I only helped my mom and dad and I remember peeling numerous pounds of potatoes and cleaning a lot of fish. That’s the path each chef should go through. When I was 18 I cooked one of my first meals. It was a single ‘gnocchi’ with Fontina Valdostana cheese filling mixed with Parmigiano-Reggiano, which ‘leaks out’ when sliced, served with white truffles. The leitmotiv of Da Vittorio’s menu is ‘Lombard tradition and creative genius’. Could you explain us that concept and food at your restaurants? 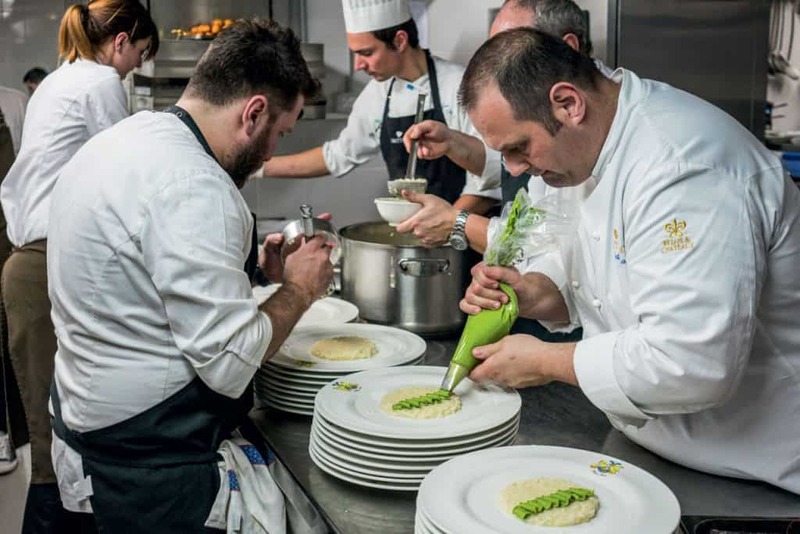 In Italian cuisine there is a kind of synergy between food, tradition, history and culture that has brought the entire gastro scene to a global level. Our menu will satisfy everyone, so everyone has the opportunity to find something to their taste. Certain dishes are made depending on ingredients of the season, such as truffles and other mushrooms, but there is always homemade pasta, such as ‘Paccheri Da Vittorio’ with traditional tomato sauce, a variety of meats, and we are best known for our fresh fish, which comes to the restaurant from all over Italy and Liguria on a daily basis – gigantic scampi weighing three to four ounces from Sicily, various types of seafood from the Adriatic, as well as international large crabs and sablefish from Alaska. ‘Le orecchie dell’elefante’ is one of the most sought-after dishes from the menu, and simply put, it is a Milanese steak. We put a lot of effort into making it and we use a special cut of veal cooked in purified butter which we then pan-fry. The result is a gorgeous golden-crust dish. Is there a guilty-secret ingredient in your kitchen – something you’d rather not be spotted using? For me, the secret in cooking food is the constant search for the best ingredient that you do not need to add many things to, which tells its story on its own. Thank God, unlike the rest of the world, in Italy and in Croatia as well there is no shortage of high-quality ingredients. When I visited Brazil, for example, the offer was extensive, but the products are of extremely low quality. I am not almighty so I cannot cook a decent meal using bad ingredients. An essential component is also passion for cooking. Are there any trends in restaurants that you think are overrated, or trends that are going to be big? Today, there is a lot of talk about bio farming, of fruits and vegetables for example, which I really don’t believe in. If air, water, and therefore land are contaminated, then there is no concept of ‘bio’, I do not believe that emphasis needs to be put on 100% pure products. Just as in fashion, trends come and go in the culinary arts, something is trendy for a while and then it’s followed by something new and so on. Trends are recycled, and traditional cuisine is implemented using modern processing and food preparation techniques. Therefore, the winning trend for me is certainly quality traditional kitchen, with a twist, that instantly hits the palate. What does it take to earn Three Michelin stars and does that add pressure to your job? What advice do you have for chefs hoping to achieve that accolade? Passion, many hours of work, luck, entrepreneurial spirit, so a little bit of everything. Getting three Michelin stars is a demanding journey of day-to-day sacrifice and commitment to the job that requires all your energy. You have to reconsider your cooking on a daily basis, and also your serving methods. You have to find your ways to make progress in the process.You have to be thorough in everything and never give up, which sometimes seems like working in a prison. When your restaurant has three prestigious Michelin stars, your job never ends. On the contrary, you need to invest more in the service, serving, cleanliness, hospitality, there are numerous things to consider, and you need to invest more than 100% of what you’re capable of. I always encourage young chefs, wherever they come from, to explore the world. To ‘walk’ from one restaurant to another and ‘collect’ knowledge, to constantly study this craft. I still explore and try new, different things, making my ‘travel suitcase’ full of new experiences. Do you follow the Croatian gastronomic scene? 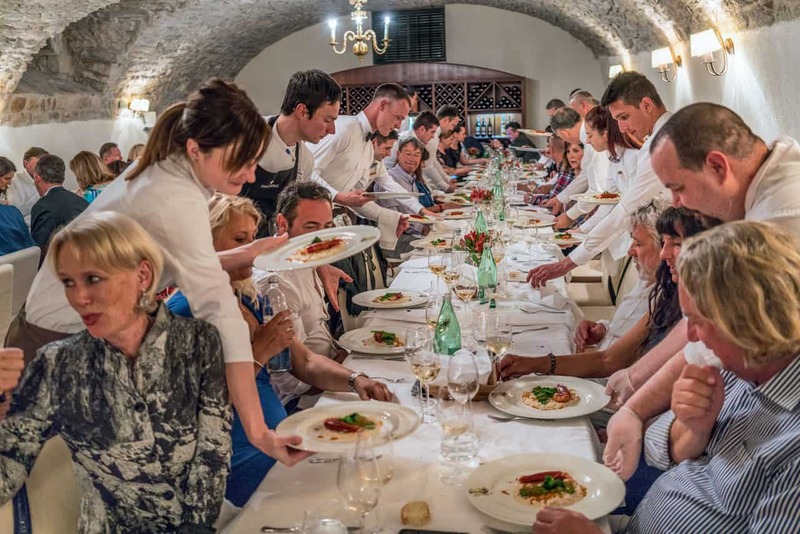 Unfortunately, I am not acquainted with the gastronomic reality of the Croatian scene, but from my point of view, and I do not want to sound arrogant, Croatia is still at the beginning of its journey. More effort needs to be put in because you have beautiful land, sea, quality products, wine, olive oil and with all of these you could easily be the sister kitchen of southern Italy. A good indication that the gastro scene is waking up are the latest Michelin stars that your restaurants have received, which I am delighted about, because it means that you are becoming part of the gastronomic circle. How did you meet Martinis team? At the end of last year, in October, I participated in Istria Gourmet Festival in Rovinj, where I met Chef Toni Miloš. We hit it off immediately so I invited him to Bergamo and our collaboration with Martinis Marchi began. I’ve been coming to Croatia for the past 10 years, and I adore Maslinica because that’s where I come with my boat. What a coincidence! I’m glad we have ‘found’ each other and that I was a part of the Wine & Friends event. What did you present at the Wine & Friends event? We prepared an extensive, five-course menu for the guests of Martinis Marchi. Foie gras cherries and croutons with tuna and anchovies went great with the welcome drink. Caesar salad with asparagus and scallops and shrimp on almond cream with roveja – a special kind of wild peas that not even Italians are acquainted with, was served as a cold starter, while risotto with prawns, a special type of broccoli and ravioli stuffed with cheese, and talaggia with maize cream and black truffles was served as a warm starter. Italian buffalo (fasson) brisket with gnocchi with pepper and fresh endive preceded the desserts.